Growing plants and grass in the lawn of your row house or bungalow adds beauty to space. However, if the grass and plants are not managed properly, they tend to overgrow. In that case, they can make the place look shabby instead of beautiful. Also, it may be an invite for rodents, insects and sometimes even snakes. Before following the steps, you must choose wisely when you should do the manicure on your lawn. Mostly a warm sunny day is preferred when there is low moisture in the air. This prevents the occurrence of turf diseases in the plants. Also, do not do all the trimming and cutting on a single day as it might kill the plant. Instead, a gradual approach is preferred to make sure that the plants stay healthy and grow further. Lawn mowing should be approached as an adventure as opposed to just an ordinary exercise because when we do so, our curiosity will lead us into discovering various aspects of the activity that we would otherwise not be able to discover. She goes on to say that when we intentionally make touch with Mother Nature, we naturally feel the inspiration to become mindful of it, and the same goes for mowing. Step1: If the grass in the lawn has reached knee height then you must use a weed trimmer to trim the high grass. Cut the grass to its half height and allow it to heal itself, before trimming further. You must wait at least for a week. Step2: Use the trimmer again in a week or maybe 5 days, so that the grass reaches a height of around 6-8 inches. Leave it after doing so. Step3: Use a mower to mow the lawn in an even manner. You must mow the lawn in overlapping passes so that all the grass comes down to an even size. Now the size of the grass must be around 2-3 inches. After mowing, make sure to water the lawn evenly and leave it for few days. Step4: After every 3-5 days you must mow the lawn again to ensure that the desired height of the grass is reached and there are no overgrown weeds in the lawn. For better mowing results, move the mower blades down to one third each time you mow. Use a different direction of mowing in each session. 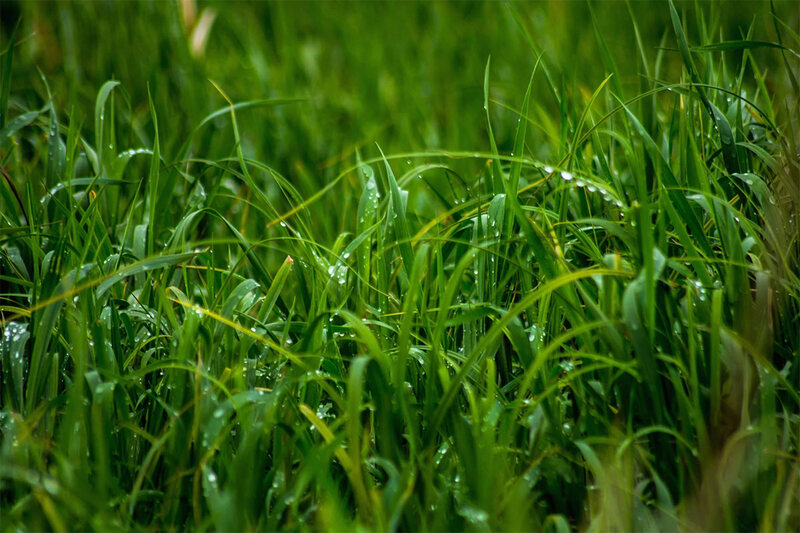 The lawn must be deeply watered after every mowing session unless it is the rainy season. Follow these steps religiously and you will not expect an overgrown lawn in your courtyard. A lawn mower is a machine which consists of rotating blades that are used to cut overgrown grass and bring it to an even size. There are several types of mowers available in the market, some that are operated on electricity and some are gas operated. Some mowers can be operated physically without any external power source. Unpowered push mowers — These are the smallest and simplest mowers that can be used for small residential spaces and gardens. They are operated manually. Electrical push mowers — These are bigger mowers which are operated on electricity. They are most suited for larger lawns. Riding mowers — These mowers look similar to tractors and can be used for larger lawns or for commercial grounds. Riding movers are also available in the form of stand on types which occupy less space and can be used in a similar manner like the riding mowers. Multi-gang mowers— These are the largest size mowers that are mounted on tractors. They have multi-blade feature and are used in commercial grounds and golf courses. How to mow a steep lawn using a riding mower? Mostly the conventional riding mowers are capable of mowing fields that are having a slope of around 1 feet height for every four feet of horizontal width. For higher heights, it is not safe as the mower can turn upside down and the rider can get injured. There are special riding mowers for steep slopes also available in the market, but they are little expensive. You can also opt for a remote controlled mower, which can work without a rider. Analyse the slope for hazards – Monitor the grass and slope carefully, so that you are sure that the slope is safe for you to mow. Also, you must make sure that there are no holes, ruts or any uneven ground that can pose a hazard to your safety. Limit the use of attachments – Mostly attachments such as grass catcher or mulcher are used with mowers to make mowing easier. But on slopes, it can increase the risk of falling from the mower by making it unstable. Mow up and down – Do not mow horizontally if you are mowing on a slope even if you are riding a push mower or a lawn tractor. Your machine may tip sideways if you mow the field horizontally. Mow slowly – Moving up and down slowly on your mower is necessary to avoid accidents of any kind. You may be an expert in mowing but undue speed can make your mowing accident prone. Mowing is a simple job which can be done by kids as well as small homes and gardens. Kids can enjoy such tasks and it can be a learning experience for them as well. However, for more complex machines and larger landscapes, trained people are required. Even some blind people do the mowing of their lawns on their own. Lawn mowing is a simple principle where you simply cut a swath then move over before cutting another swath and that this has to be done until you achieve your desired look. He continues to say that as you practice, you will now learn how far you can move without necessarily having to cut same space again or leave grass uncut.